Former WHS student Jared Kirk wants a future where he can share the joy of travel with his family through his flying. A new international pilot school in Whanganui has more than doubled its student intake in about a year. Reporter Jacob McSweeny reports on what is fast becoming a jewel in the crown of Whanganui Educaiton. Foraa Budhbhatti loves being thousands of feet in the air and in control. "I just love the general idea of a human being flying," says Budhbhatti with her hands on the control wheel of a flight simulator we're sitting inside. "And these machines are just so advanced, such beautiful machines. It's just a pleasure. "To be honest, I am afraid of heights. But once I'm in the cockpit and once I have the control in my hands I feel like I have control of the aircraft and I don't have any fear once I have control of the aircraft. It's just a beautiful feeling for me." From Mumbai, Budhbhatti has been living in Whanganui for about a year now and she's one of a group of about 70 foreign students learning to become a pilot here. One day she will be the pilot taking people on international journeys. And with her on those journeys will be what she learned at the International Commercial Pilot Academy on the outskirts of Whanganui. "It's a pretty big cultural change when I came here from a big metropolitan city. It's pretty interesting though - love this place." Budhbhatti achieved her private pilot's licence in August and in November she passed her test to become a commercial pilot. All of this comes naturally to her though, both her parents are pilots. Things are on the up for the International Commercial Pilot Academy. It is quickly becoming a jewel in the crown of Whanganui education. When the school was bought by Whanganui District Council Holdings in 2015 it had 37 students. It now has 83 students. The academy's chief executive, Phillip Bedford, wants to lift that to 200 students. Just a few weeks ago, Regional Economic Development Minister Shane Jones announced Whanganui was to get $400,000 to make a business case for an advanced aviation hub at Whanganui Airport. The hub would have one of New Zealand's few high-tech flight simulators, suitable for training the pilots of large modern planes. "There are only one or two others on a similar scale at the moment. A lot of pilots in the world now are being trained on the simulators, not in the sky," said Whanganui Mayor Hamish McDouall following the announcement. "The hub could really make commercial aviation training part of our Whanganui landscape. Not just pilots, right across the board." Bedford says it's likely the academy will operate the hub on behalf of the council's holdings company - but it's early days and he is waiting to see how the business case unfolds. A month ago the academy welcomed three new aircraft. 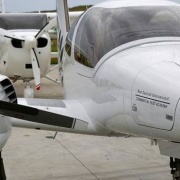 They included a Diamond DA42 with an advanced Garmin 1000 avionics system, enabling students to work with flight technology not previously available at the academy. There were also two Cessna 172s, refurbished by Oceania Aviation in Hamilton. "We can advocate from here on in that Whanganui is New Zealand's aviation city," Bedford said at the unveiling of the new planes. One of the academy's main initiatives has been to give secondary students a chance to take on pilot training while they're still in high school. They do one day a week of theory training and during the weekend they jump in the cockpit and fly planes. 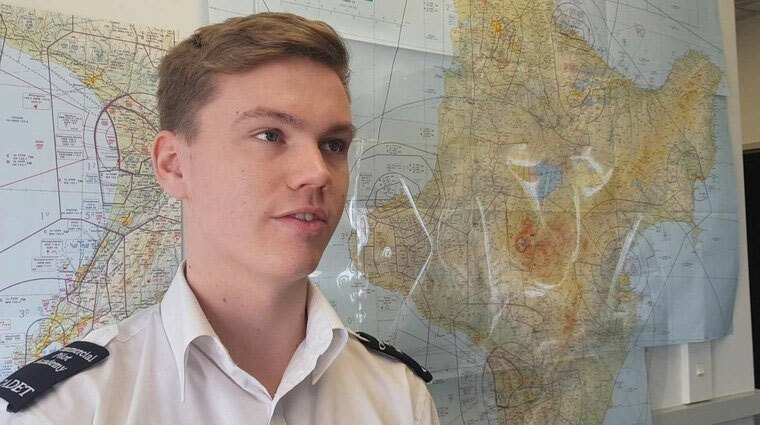 "In the past if you had wanted to be a pilot you would have gone to your careers adviser ... they would have said to you the subjects you need to take are maths, physics and English," says Bedford. "Now you can go to your careers adviser ... they'll say the subject you need to take is pilot training. Yes there will still be maths, English and physics in there but it's just more direct. It's more targeted. I think it's probably more motivating right? You know that what you're doing is becoming a pilot." If a student starts at Year 11, they're able to achieve a private pilot's licence before they finish secondary school. They would be able to fly mum and dad to a holiday spot but wouldn't yet be able to take paying customers. The students eventually finish a two-year Diploma in Aviation but starting at high school study gives them a head start. They would finish their commercial pilot licence requirements as part of the diploma. Like Foraa Budhbhatti, Jared Kirk is another promising student on his way to becoming a commercial pilot. "Flying's just great fun ... being able to go to different countries and different places ... it's just great," he says. "My family's always had an interest in flying. I've been very, very privileged to go to so many countries around the world. I've just seen that in my future and my future family ... wanting to take them travelling and get the same experience I did." He's done 70 hours of flying and recently got his private pilot licence and is half way through the two-year diploma. From that point he hopes to stay on at the academy as an instructor. That is the common pathway for a lot of students because it is a means of building up hours, Bedford says. "It's a great first job for a first pilot ... by teaching things you need to understand them very well. "And you become very, very good at flying aeroplanes in commonly taught emergency situations so the pilot skill is enhanced. It helps building hours towards the requirements for the airline which can be between sort of 500 and 750 hours at the moment." Don't be fooled though, pilot training happens very quickly. "Typically someone might turn up here having never flown an aeroplane before and they will finish with a commercial pilot licence within 12 to 18 months of starting," says Bedford. "They then go on to do some multi-engine instrument rating training - specific to the country they are going to fly in. Each regulator has its own number of hours, how it should be examined and what approach to instruments you would use." International students then have to go home or somewhere else overseas to do this training. Bedford hopes the advanced aviation hub announced by Jones will mean apprentice pilots will be able to do that training in Whanganui. The idea of the academy came about when Whanganui District Council Holdings directors Matthew Doyle and Harvey Green were thinking of ways to keep the airport financially viable. "We always knew Air New Zealand was a possible risk. When we considered it we still had Air New Zealand but we knew over time ... we're a small provincial airport supported by the agricultural guys, but we always knew Air New Zealand might be a risk," Doyle says. Air New Zealand ditched Whanganui in July 2016. Doyle says Whanganui had a history in aviation training in the 70s and 80s and they believed a flight school would be a good option to financially support the airport. "We'd thought of flight schools. We thought, well, if we find one or we could build one - it was in our strategic plan. "Then we happened to find a business for sale in Feilding of a retiring guy who was 70 selling his flight school. And we found it on Trade Me." The flight school is now pumping money into Whanganui airport every month - they pay for each landing there. "We're doing about 600 hours a month at the moment," says Bedford. "By volume we pay the majority of landing fees at the airport - 1343 landings during October." Doyle estimates a landing might cost about $10. Doyle says the airport is crucial to economic development in Whanganui. "If the airport's strong and we retain linkages like Air Chathams, that keeps the business community linked with Auckland. "Then if you bring some students paying reasonable money to the community and they go and spend it at not only McDonald's but down the main street ... then that adds to the vibrancy of our community and economic development." Doyle and Bedford estimate the flight academy has brought roughly $10 million economic benefit to the region in the past 12 months. The school is currently deciding over 10 domestic positions for next year's diploma. They've got more applicants than positions and students will find out if they've been selected in January. Bedford said they have 16 places for domestic students in the academy at any given time, which is based off funding from central government. He's trying to get more. There's big plans for the school's international programme. Each month in 2019 the school will induct five students from India - totalling 60. "That's basically doubling our student numbers with India." The academy was starting to look at Southeast Asia and China for international students. Earlier this year it announced a Memorandum of Understanding so it can offer students a Bachelor of Applied Management at UCOL to go with their Diploma in Aviation. It's of particular interest to students coming out of Southeast Asia to have a degree alongside their pilot qualifications, Bedford says. The academy is also looking to develop its business opportunities and what it can offer members of the public. It does several charter flights to places like Mt Ruapehu, Mt Taranaki as well as a scenic flight over Whanganui. People can also buy a "flight of discovery" where someone interested in learning to fly can have a 20-30 minute trip with an instructor. Whanganui's new Pilot Academy is flying high. Photo / Jacob McSweeny.